Emily Belknap’s “Vacant Lot” will be on display during an exhibition of her works as part of the Chazen Prize to an outstanding MFA Student. Instituted in 2012 to be given annually for five years, the Chazen Prize recognizes the creative excellence of a third-year MFA student in the UW–Madison Art Department. The award includes a museum exhibition and a monetary contribution intended to help the student further his or her artistic career. 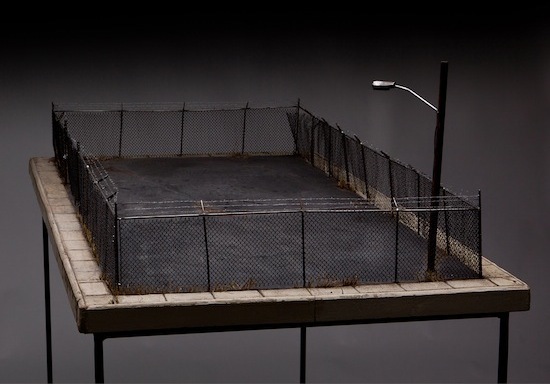 “Backyard Dilemmas: Constructed Landscapes by Emily Belknap” will be on view at the Chazen Museum of Art from March 30-May 12 in the Oscar F. and Louise Greiner Mayer Gallery of the Elvehjem Building. There will be a reception on Thursday, April 4 from 5:30-7 p.m. in Paige Court. Support for the exhibition has been provided by the Chazen Museum of Art Council and the Wisconsin Arts Board with funds from the State of Wisconsin and the National Endowment for the Arts.